With more than 5 lakh applied for the 2014 Kerala Plus One courses, the admission process is nearing the next phase of selection. The trial allotment list for the Plus One Admission 2014 will be published on 24th June at the official of the Higher Secondary Education. The primary allotment would decide the fate of more than 5 lakh students who had passed the 10th standard exam. But the enormous number of applicants would limit the dream of many students who wish to pursue their higher education with the state government schools. According to available information, the number of seats available is only 3.67 lakhs while 3.27 lakhs are channelized to Higher Secondary, 26,000 in VHSE, 9,000 in Polytechnic and 3,000 in ITC. Even though the government plans to allocate more seats and new plus one batches, more than 1 lakh students will have to continue their learning process with the open school. The Higher Secondary Education department which is in charge of conducting the admission has given ample time for students to submit online application. From 9th June onwards the state education department initiated to supply forms through schools to those students who couldn't submit application online for various reasons. After the time of submission, the number of students applied in schools range from 30 -1700. The number of applicants had risen due to the increase in interest of students from CBSE, SAY exam winners and SSLC passed students from other states to join the Kerala government education sector. More than 50,000 applications other than those who passed Kerala SSLC have been received. The whole procedure is done through the Single Window System (SWS), while the trial allotment would be generated on the basis of the options registered by candidates. The trial allotment can be considered to be the gateway to the admission process giving students clear idea about the transparent system of allocation of seats to various courses and schools. As soon as the trial allotment gets published at the website, students can check their allotment status by submitting the application number and date of birth. 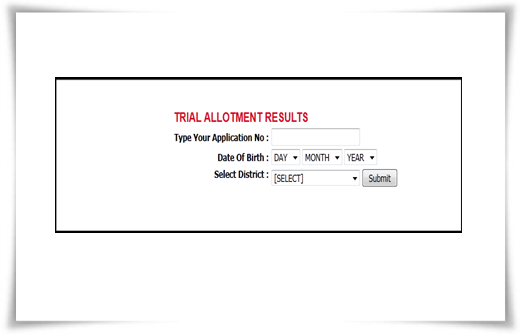 To view the trial allotment, students should navigate to candidate login section and login by entering his/her application number and password there. Students will be given ample time to revise options. After the time earmarked for modifying options, the first allotment will be declare at the official website of the HSCAP. Students are advised to keep touch with the HSCAP website and also should follow the updates regarding the admission which will be published in the leading dailies. Check http://www.hscap.kerala.gov.in, the HSCAP admission website to know about the allotment.